My aim is to provide a professional, friendly, caring and nurturing treatment, leaving you relaxed and stress free ! Hello and a warm welcome to my website! My name is Carol Burgess, I am a Holistic Therapist offering Reflexology, Specialist Fertility Reflexology, Maternity Reflexology, Hot Stones Reflexology, Ziggie Bergman Advanced Facial Reflexology, Aromareflex, Thai Foot Massage, Angelic Reiki, Crystal Healing and Atlantean Healing from my tranquil premises in Burwash, East Sussex, which is convenient for Uckfield, Heathfield, Wadhurst and Robertsbridge areas. I began my journey in 2005 when I learnt traditional Usui Reiki and my life took a more spiritual path from my career as a successful debt collector in the City for one of the top 10 law firms in London, then within advertising and publishing companies working in a pressurised and stressful environment, to wanting to a more tranquil way of life and something which would nourish my soul and to fulfil my desire to help and care for people. I made the decision to leave the City and moved to Uckfield, East Sussex and change my career to a holistic therapist, whilst also bringing up my four lively children, twin boys who are now age 17, a boy of 9 and girl age 7. I since graduated with a Merit ITEC Diploma in Reflexology after training with the prestigious Wilbury School of Massage and Reflexology in Brighton, which has been training students since 1982 . My professional development continues, I am the only Qualified Practitioner in East Sussex trained to a high standard by Barbara Scott from Seren Natural Fertility to offer Reproflexology™, It is now thought that 1 in 6 couples with have problems with Fertility and conceiving, and fertility is rapidly declining each year. The post graduate in depth training was over four days with case studies, which continues with ongoing learning by fertility masterclasses, webinars and lectures with experts in the cutting edge of Fertility developments, the most recent fascinating lecture was with renowned Fertility expert Alpesh Doshi, Senior consultant Embroyologist from IVF London, one of the first Scientists to bring egg and embryo technology of 'Vitrification' to the UK in 2007, Alpesh explained about Egg donation, freezing and Pre implantation Screening (PGS), fertility preservation, Chromosome Analysis. Members of The Association of Reproductive Reflexologists are specially trained, using structured and prescriptive treatment protocols to support couples through all stages of their fertility and conception journey, including pre conception, sub-fertility, un-explained infertility, Clomid, IUI, IVF and ICSI, donor or surrogacy cycles. Female and male reproductive disorders, such as Polycystic Ovary Sydrome (PCOS), Endometriosis, Fibroids, irregular or painful periods Low Sperm Count, sperm DNA damage. for more information please see my Reproflexology Page. I have also completed the Suzanne Enzer 4 day post graduate maternity course, run by Jenni Tribe a qualified midwife to ensure I am able to practise safely at all stages of pregnancy. During 2017 I gained a qualification in Hot Stones Reflexology with Sally Earlam and In 2018 I completed Advanced Aromareflex, where treatments can be enhanced by Aromatherapy blends with Heidi Armstrong, Complementary Therapy College. I am an Master Practitioner in Atlantean Healing™ and work with beautiful energies of Angelic Reiki, where I have also trained to Master Practitioner level along with Phillip Permutt Advanced Crystal Healing, I am certified Lightworker and work from my beautiful tranquil premises surrounded by acres of countryside in Burwash, East Sussex. During February 2019, I trained to Advanced level in Facial Reflexology with Ziggie Bergman, facial reflexologist to the famous! and qualified in Thai Foot Massage. I am dedicated to ongoing professional development to help enhance my treatments and to bring further benefits to my clients and to make sure my qualifications are up to date to ensure membership of the Association of Reflexologists and BCMA. I am fully insured and hold a valid first aid certificate.
" Visited Carol yesterday at her new premises for my second treatment & cannot recommend her highly enough! 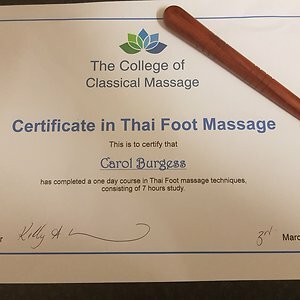 Carol offers a highly professional service from start to finish in the most relaxing environment, surrounded by the beautiful Sussex countryside. I had THE most blissful nights sleep last night & woke feeling totally rejuvenated. 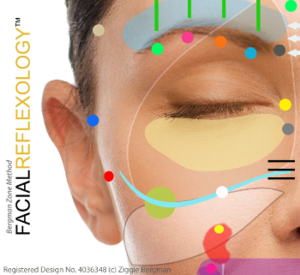 Looking forward to my next session... "
I have just completed my advanced Facial Reflexology Course with Ziggie Bergman reflexologist. Keep an eye out for my launching special offer and experience the ultimate in relaxation and beauty and anti ageing benefits!